"You may think that you're getting off free, but there's other justice in this world besides the law..."
It's amazing how specific nuggets of pop culture stick in your mind as a child, indelible images that are instantly tattooed to your brain. Those snapshot memories are just as vivid now as they were 30-odd years ago. 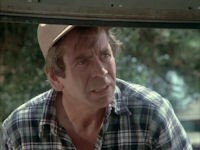 For whatever reason, I'll never forget the excitement surrounding who shot JR (despite being more of a Dynasty fan), commercials for all three of the Jaws films, the tapping on the window from Salem's Lot, the Super Friends take on the Legion of Doom, a mother being murdered with a garden shovel by her daughter in Night of the Living Dead, rooting for Heather Locklear in Battle of the Network Stars (omg, I even watched the low-rent ripoff Star Games! ), rooting for The Scooby Doobies in Laff-A-Lympics, covering my ears with my fingers every time Norman Bates swiped at the shower curtain (the music always scared me more than the visuals) and biting my nails as the end of each short story in Cliffhangers, the short-lived NBC serial that had that futuristic elevator and that spooky snake in the opening credits (be careful, Susan Anton!). Usually you chalk up these warm remembrances to nostalgia and nothing more--you realize that comedies you thought were funny actually aren't, animation you thought was awesome is actually cheap (see above) and things that once scared you are actually laughable (that vampire serial in Cliffhangers? Yeah...it was a romantic soap opera). But every so often, some gems hold up just as well as they did decades earlier. 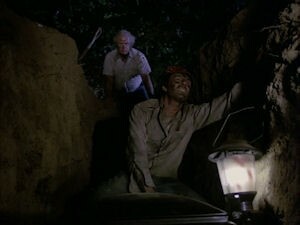 And just like George Romero's zombie allegory and Hitchcock's calling card, an unforgettable 1981 made-for-television movie that has stayed with me my whole life deserves its place alongside those timeless classic. It's been a long wait for fans, but finally (finally! 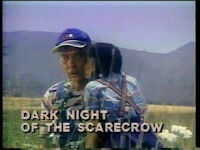 ), Dark Night of the Scarecrow--an underrated masterpiece and one of the greatest horror films ever--is available on DVD nearly 30 years after it made its CBS premiere on October 24, 1981. 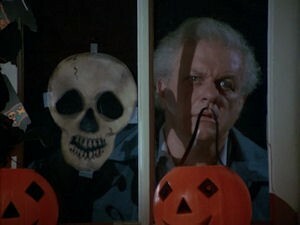 Fall has descended in a small town, and local mail carrier Otis Hazelrigg (Charles Durning, two years removed from the memorable thriller When A Stranger Calls) is a modern day Ahab with one mission in life: to harass Bubba Ritter (Larry Drake of L.A. Law and Dr. Giggles), a mentally challenged 36 year old and misunderstood gentle giant. 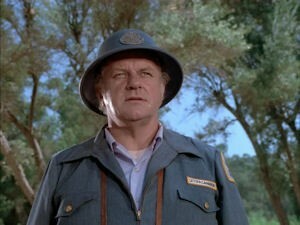 Otis--who fancies himself an army general--is convinced Bubba is always up to no good. He is particularly concerned with the man-child's friendship with young Marylee Williams (Tonya Crowe, who went on to a successful run on Knots Landing). "Something's gotta be done...but it has to be permanent," says Otis, who watches his target's every move like a hawk, ready to pounce at a moment's notice with the assistance of his three blue collar buds: right-hand man Harless (Lane Smith, perhaps best known as Perry White from ABC's Lois & Clark), feed factory owner Philby (name an '80s TV series, and Claude Earl Jones has probably made an appearance) and mechanic Skeeter (Robert F. Lyons, another hard-working actor still going strong). Sometimes against their better judgment, the trio follows the lead of Otis ("It was your idea he's dangerous in the first place," says Harless. 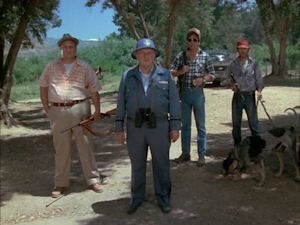 "You're the one that always wants to run down there and rub his face in the dirt!"). And when a mishap with a neighbor's dog leaves Marylee in peril, a rush to judgment has the four middle-aged men doling out their own form of justice--one that leaves Bubba dead and buried. Almost immediately aware of their mistake, the quartet is suddenly in panic mode--but a lack of evidence prevents any justice from playing out in the court system. Vowing to keep their mouths shut, the misguided vigilantes get back to their day-to-day lives...but when strange things start to happen, fear is alive and well in the hearts of our criminals: "Someone knows, Otis!" As the mischief mounts, the men are convinced someone is after them. 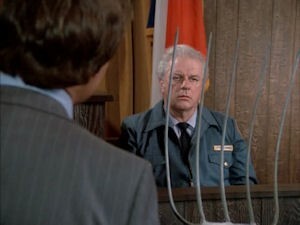 Perhaps it's district attorney Sam Willock (Tom Taylor), who vowed to bring the men down after the sham of a hearing ("If I ever find a single shred of evidence, I'll see every one of you on death row!"). Or maybe it's Bubba's mom (Jocelyn Brando, older sister of Marlon), who couldn't protect her son when it mattered the most ("There's other justice in this world," she warns Otis. "What you sow, so shall you reap..."). 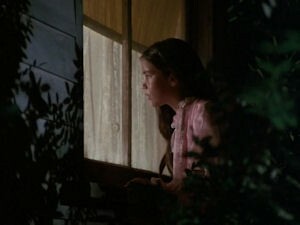 Suspicion even starts to fall on Marylee--is she a bad seed in the making? The young girl isn't even convinced Bubba is truly gone ("Don't worry, Mrs. Ritter! 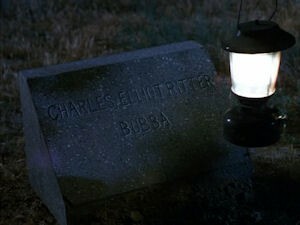 Bubba's not gone, he's just being silly. Don't you know what he's doing? He's playing the hiding game!"). The men even start to doubt each other--has one of them turned on the group? 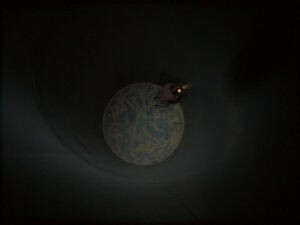 It's a credit to the filmmakers that you're kept guessing for so long, and Dark Night masterfully envelops you in its building tension from the opening title sequence--where Glenn Paxton's sparse score of tense strings and drums instantly puts you on the film's tightrope. That's an especially remarkable achievement considering that this is a TV movie, which usually likes to spend some time doling out back stories before getting to the good stuff. But there isn't an ounce of padding in these 95 minutes, which almost instantly places us in the conflict. Dark Night is a patient film that's all about atmosphere, a truly classic approach (and apparently a long lost art) that is exactly what true horror is all about. We're given no time to relax or catch our breath, and it's remarkable that the film can sustain its mood throughout. It's in no hurry, taking its glorious time to set the stage and build its momentum. Feigelson initially hoped the venture would be a feature film, and its shows: Everything about this effort screams quality, and its "TV movie" label doesn't do it justice. This is a subtly scary effort, one that uses simple yet stunning shots (there are countless arresting visuals here) along with sparse, sometimes startling sounds--like the ever-present rustling wind, the squeak of a screen door's wire hinge, the sound of heavy footsteps on straw, a creaky stairwell, a boiling tea kettle, pigs woken form their sleep, a clanging chain and the caw of a crow--to optimum effect. 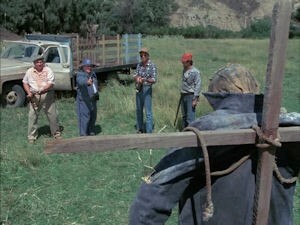 And the score--like the scarecrow itself--takes on a life of its own. This film features long stretches of quiet, allowing itself (and us) to soak up its eerie atmosphere as it calmly creeps up on our eyes and ears. Then there's the iconic image of terror that gives the film its signature--one that no film before or since this effectively. 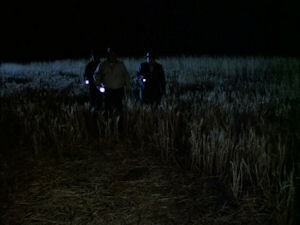 Dark Night doesn't overuse the scarecrow, making its few appearances all the more chilling (I love how its first reappearance after Bubba's murder surprises us, coming out of a calm conversation that lulls us into a false sense of security). Whether barely visible in a long shot of a vast field or so up close and personal you can practically smell the dry burlap sack, the image--like the movie--lingers long afterward. 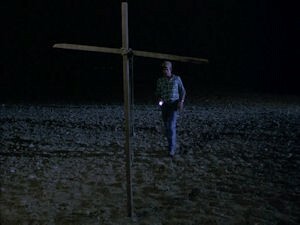 De Felitta (best known as the writer of Audrey Rose and The Entity) and cinematographer Vincent Martinelli have crafted a massive amount of stunning shots and sequences (and the lighting throughout is fantastic)--nothing tricky, just pure and potent stuff that takes advantage of the film's locations, themes and shadows (Philby's stroll at night features one of the best uses ever of a shot horror films have done to death). 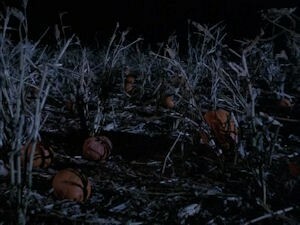 The story gives us some classic set pieces that take advantage of the fall season: a church Halloween carnival, a pumpkin patch, a graveyard, barren fields...I'm in horror heaven just thinking about it. And while Dark Night isn't gory, its few uses of red are unforgettable (it's amazing how much more effective blood is when it's used sparingly). 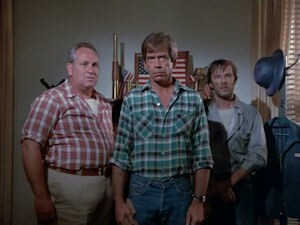 For a 1981 made-for-network-television movie, this is pretty risqué with some of its visuals and themes (just wait until you learn more about Otis!) --giving it more than enough bite to compete with any R-rated effort. And whether it's the wood chipper or the silo sequence or the scarecrow imagery, this film has clearly had an influence on films that followed (I'm looking at you, Fargo and Witness...). And the film's few brief stabs at dark and devious humor work beautifully (the preserves and the hat...brilliant!). It isn't easy to successfully pull off such attempts without ruining the mood in a chiller like this, but Dark Night is pitch perfect with its few comedic elements. The performances are also perfect--Durning is so creepy, it's almost criminal. He commits to Otis' single-minded mission and masterful manipulation, never releasing his tightening grip on his "friends" or the audience. 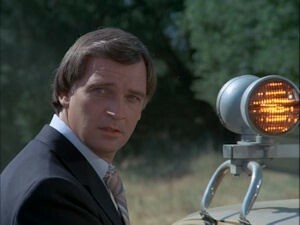 His cool exterior slowly cracks as the action escalates, his eyes and face telling the story (as Feigelson says in the commentary: "Look at the wheels turning in his head...you can see it"). 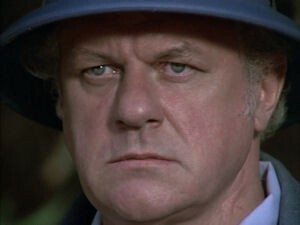 The film gets just as much mileage out of his quiet yet terrifying gaze as it does with any of its other winning shots. 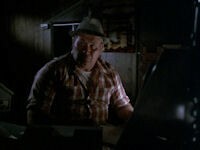 Just when you think Otis can't get any more evil, he raises the bar ("I'm not gonna hurt you...you're not afraid of me, I'm a mailman! 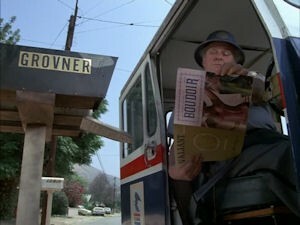 No one's afraid of the mailman!"). And Drake--his face and eyes echoing Bubba's extreme emotions--never overdoes it in a crucial role that could easily have been a disaster in less capable hands. 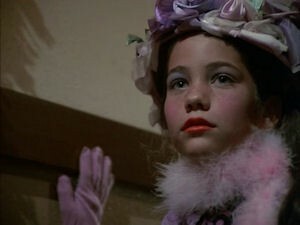 But it's Crowe that surprises the most, and I'm stunned that a child actor in a made-for-TV movie is this good. 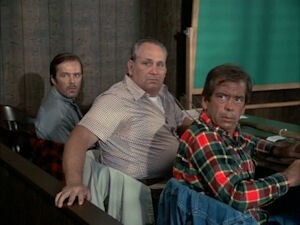 Just watch the scene at the church carnival, a quiet standoff between her and Otis. 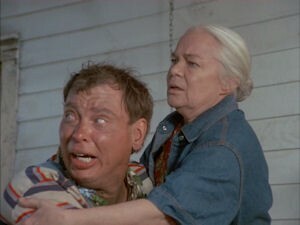 It's one of many unforgettable scenes that show remarkable restraint and understanding. This is a complicated role that could have easily ruined the film--the young actress is afforded every opportunity to screw things up and she never does, showing a nice range and believable emotions, ones far beyond her years. Her character is also critical in injecting that childlike innocence and fear into the story, one that makes this film equally accessible to the younger generation. Dark Night works beautifully for both audiences, and a lot of that is thanks to Crowe. How young children process what death means for the first time in their life is a crucial element in the story, and the film (and Crowe) give the story added depth because of it. As for the finish? Simply perfect. The beautifully constructed conclusion gives Scarecrow a sort of mythological feel, almost like a modern day Greek tragedy. And that brings me to this "restored" version. Before I listened to the audio commentary, I had written this line regarding the end of the film in my review: "There's a very brief shot I probably would have removed." Turns out the shot that bugged me was never there to begin with--the second-long shot (a very quick insert) was added to this restored version. I hadn't seen Dark Night in ages, so would never had known it wasn't there before. 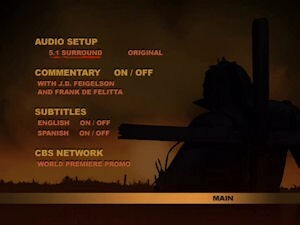 But in the commentary, Feigelson and De Felitta note that this quick footage was added "to make clear" an intent (I'm assuming it is the only major change to the film). I don't approve--I don't think anything needs to be made clear, and the shot ruins what could have been a more ambiguous, spookier scene open to interpretation. The film maintains more mystery and mystique without the new footage--although most viewers (myself included) would probably assume it was implied, anyway. Still, I can't help but fret over the fact that the scene has been altered (albeit very minor) to appease idiots who need things spelled out for them. But despite my distaste, it doesn't come close to spoiling the film in the slightest (I'm just being picky, and until I listened to the commentary I wouldn't have known the difference). The overall impression of this masterpiece is so poetic and spooky, I couldn't have asked for anything better. 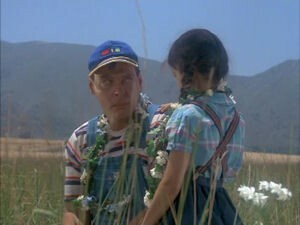 This film scared me as a kid, and it scares me now. It's rare for a film to instantly set you on edge--and keep you there the entire time as you watch with unblinking eyes, pounding heart and frayed nerves as the story unfolds. The anticipation, suspense and atmosphere here are undeniable. 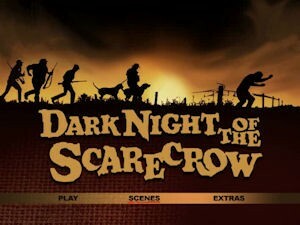 Dark Night of the Scarecrow is a forgotten classic--one of my favorite all-time horror films, a timeless tale that shows how honest horror is done. Are you kidding? A 1981 made-for-TV movie looks this gorgeous?! 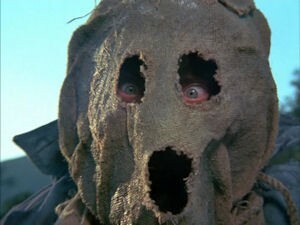 I guarantee you Dark Night of the Scarecrow has never looked this good, certainly not on its initial broadcast. The last minute of the closing credits site a digital colorist, a DRS artist, a digital restoration person, an editor...and whatever they have done, bravo. The sharpness and level of detail in this full-frame presentation is simply gorgeous, and many of the colors pop. The film maintains a healthy level of grain and has some extremely minor shimmer that is barely worth mentioning. By and large, the picture is better than I would have ever imagined. 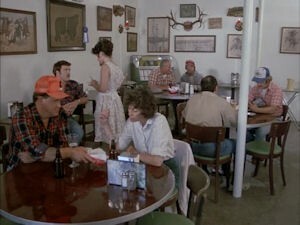 Skin tones and textures on clothes, wood and walls are impressive, and a number of other details constantly impress: the hair on the actors' arms, the reflection on the table in a diner (and Otis's truck, and Harless's sunglasses), the glimmer in everyone's eyes, the detail on lace curtains and a screen door, the glitter in a Halloween decoration, the burlap sack, leaves in the woods, the blacked-out letters of a gas station sign, the beads of sweat down that form and trickle down faces (and not just in the close-up shots)...all of it stunning. 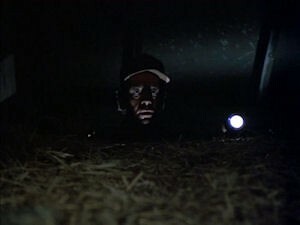 Some brief shots in the darker scenes aren't quite as detailed, but most of them are still superlative. The disc has two options: the original mono and a 5.1 effort (a soundtrack restoration is also listed in the closing credits, so it has also been spruced up). The 5.1 track makes nice use of the film's essential score, with a nice balance complimenting the visuals. The rear channels are mostly used for sounds like the wind, the caw of a crow and the cicadas. The dialogue is sometimes overpowered for very brief moments, the only weakness here (you may have to concentrate or adjust the volume to hear a few exchanges perfectly). It also sounds like some white noise/static very briefly intrudes just after the 58-minute mark (when Philby makes a discovery). The mono track has the same minor dialogue issues, so I'd opt for the 5.1. 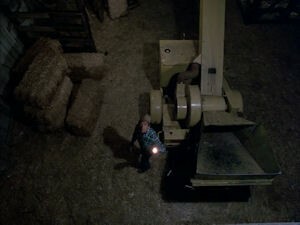 In the commentary, Feigelson notes that the sound has also been slightly altered on one scene--where a wimpy silo sound effect was replaced with a more powerful effect obtained from an industrial dumpster ("It gives it that huge empty echo feeling"). "I don't shoot television...I shoot movie shooting, what is necessary. And that is what we got." The two comment a lot on the sets and locations (due to the low budget, most of this was shot on and in existing structures), elaborate on the silo and wood chipper scenes and note that most of the night scenes were actually filmed at night (which I agree helps the film immensely). 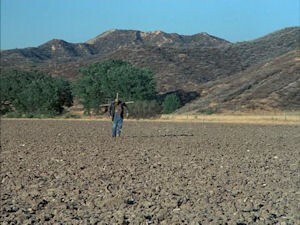 A few other interesting tidbits: Cool Hand Luke's Strother Martin was originally meant to play Otis , but passed away before filming (but not before he left his stamp on the script: "He's physically mature"); De Felitta wasn't too keen on the constant presence of Tanya Crowe's "keeper"; excessive heat shortened the shooting schedule from 18 to 17 days; the daughter of famous editor Gene Fowler Jr. stepped in to provide a scream for an actress; Feigelson took a special trip to Texas to capture the sound of cicadas during the summer (a constant, crucial element in the film), feeling the sound of crickets was too "happy"; a CBS executive didn't want the full name of the graveyard (Green Pastures) to be shown since it was the same name of the cemetery where his father was buried (the exec won); while another exec objected to one of De Felitta's stabs at dark humor (the director won). While the plot recitation is often unnecessary, the men provide a few intriguing thoughts on various dynamics, point out a crucial element of the inciting incident (one I hadn't really noticed before, it certainly adds a unique dimension) and explore Marylee's state of mind (and its importance to the film's power). 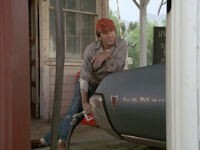 They are also constantly complimenting the score by Glenn Paxton: "This really did require a lot from Glenn because there are so many scenes in this that do not have dialogue that have to have a musical commentary," says Feigelson. I wish the commentary talked more about the film's restoration and legacy, but I'll take what I can get. (Feigelson also has a 4-minute video interview on Amazon, where he talks about the origins and inspiration for the work...and hints at a sequel?!). 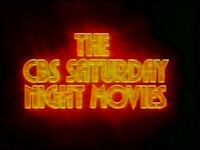 You also get the cool "CBS Saturday Night Movies" promo intro (1:00), which immediately preceded the film's broadcast (that theme music and those images bring back memories!). The preview shares too much, but I love it anyway (it also gives a taste of what the video quality was at the time, a far cry from the pristine print here. 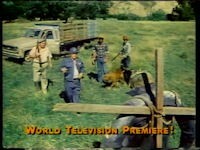 A VCI trailer compilation rounds out the package. It's a shame we couldn't get a "making of" or retrospective that interviewed Durning, Drake, Crowe and Lyons...the only thing standing between this and a DVD Talk Collector's Series rating (the film itself easily qualifies). and then how very quickly it deteriorates." You want blood and guts? Leave me alone. 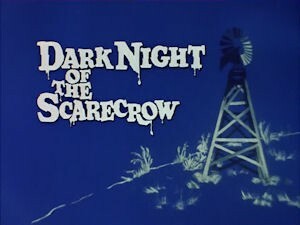 Dark Night of the Scarecrow isn't just one of the best made-for-television films ever made, it's one of the best horror films of all time. Yeah, you heard me. Long overdue on DVD, this under-appreciated film is classic horror in every sense, one that shows how powerful patience and pacing can be. Instantly setting you on edge and keeping you there the entire 95 minutes, it's a showcase of eerie atmosphere that relies on its unsettling mood and tension as it portrays a modern day Greek tragedy. Utilizing masterful performances, locations, shots and sounds, it's a simple and subtly scary effort that relies on restraint. It stands the test of time and features an iconic image of evil that has never been more powerful, making this a classic steeped in frightful fall ambience, colors and imagery. Oh, and that transfer? Stunning. Highly, Highly Recommended.